As I’ve been speaking with various customers about the benefits of VMware’s new vCloud Suite on the Vblock, one persistent question that I’ve been receiving is this – “Is vCloud Automation Center [aka. DynamicOps] eventually replacing vCloud Director and if not, how do the two work together?” That’s a fair question given that the two products were previously considered competitors. And it is also true that the two products can be implemented independently of each other to stand up a Cloud. For example, EMC vSpecialist, tzik Reich, has an excellent blog post that details an EMC Cloud Service Delivery PoC, using vCloud Automation Center (vCAC) without vCloud Director (vCD). 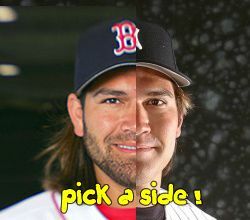 It’s no wonder that some folks may view the marriage of DynamicOps with VMware as being akin to Johnny Damon joining the New York Yankees after having been with hated rival, Boston Red Sox. So how exactly will vCD integrate with vCAC? To provide my take on this, I want to very briefly summarize and illustrate the integrations points between the two products. I’ve been helped by thinking of and describing vCAC as a multi-tiered Cloud management framework (Illustrated below in a VMware deck providing an overview of vCAC 5.1). Note that the tier model and names are my own and do not represent official VMware terminology and the tiers are not strictly separated but do overlap. Presentation Tier – The upper tier is the interface to the end-users/consumers who access resources and applications provisioned from the Cloud. This access is provided via a self-service web portal that allows users to request resources from a catalog of services. Policy Tier – The tier below provides the policies and governance which dictate what and how consumers can access requested resources. These policies can be applied to either physical or virtual resources that sit underneath. Resource Tier – Physical and virtual resources provisioned from the underlying infrastructure are assigned to reservation pools (Cloud Blueprints and Resource Reservations) and prepared for consumption, in compliance with customized business and IT policies. Infrastructure Orchestration Tier – The bottom tier orchestrates the provisioning of the underlying resources for a customer’s Hybrid Cloud. These resources can be physical infrastructure, virtual data center, or a Public Cloud. vCAC Integration with vCD The integration of vCD with vCAC primarily resides within the Resource Tier that I described above. 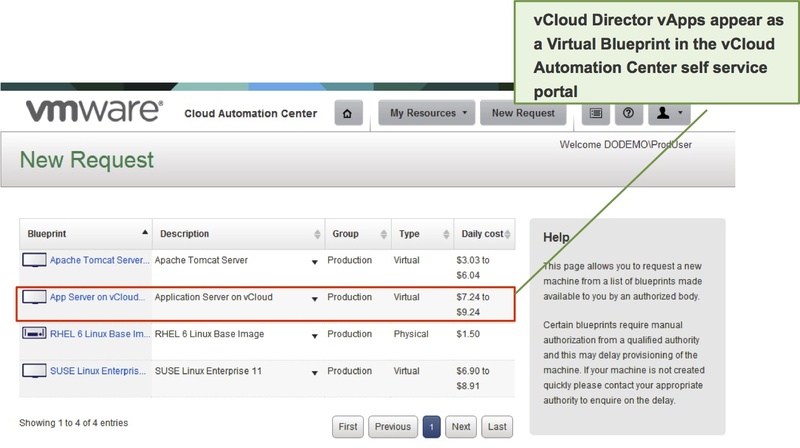 vCAC can discover vDC and vApp resources and import them into its reservations pools; it can also import vCD vApp catalogs and expose them to consumers as vCAC virtual blueprints that can be requested. They key here is to understand that vCD is providing the resource pools on top of which vCAC can build out vSphere-based services to be consumed via their self-service portal. vCAC resource pools can also be created from non-vSphere resources, such as non-virtualized operating systems, other hypervisors, or Public Clouds, by leveraging those specific resources’ available tools. Some of the acknowledged weaknesses of vCD has been at the presentation and policy tiers; the web portal is not as customizable as most users would like and vCD lacks the ability to apply a variety of business policies and governance to its resources. It also lacks the orchestration and workflow capabilities for automating the provisioning of virtual and physical infrastructure. With the introduction of vCAC into the Enterprise version of the vCloud Suite, these capabilities that are lacking in vCD can now be handed off to vCAC. In the new vCloud Suite 5.1, vCAC focuses on the presentation and policy tiers and leverages vCenter Orchestrator (vCO) to automate the provisioning of the underlying infrastructure. I would appreciate feedback on this post and rather the multi-tiered model is helpful in explaining the integration between vCD and vCAC. In particular, please let me know if there is anything that is unclear or needs to corrected in may explanation. Nice write-up and good summary. 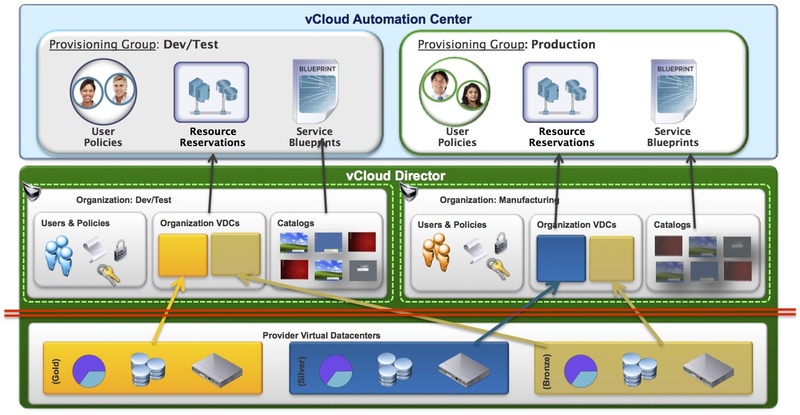 The vCloud Director and vCloud Automation Center products are very complementary to one another. The vCAC product is focused more on the presentation and workflow layer, as you described. One point I would make is that vCAC can and does leverage more than just vCO for handling the provisioning processes, in fact the overlap with vCO is probably greater than the overlap with vCloud Director. Fortunately, we have the option of integrating with existing vCO workflows but could also potentially replace some of the vCO workflows with pre-existing vCAC workflows. In typical form, it usually comes down to the requirements to dictate the best solution for the job. Thanks for doing this write-up. I’m a virtualization consultant and this is the “hot” topic among my clients. Most companies have already implemented vCD and use it primarily for managing internal IaaS resources. I believe that the intention of vCD was to help IT departments provision and manage resources in an elastic, consumable pool. Yes, vCD has a store-front, but as you described it lacks customization and granular policies. I see vCD as more of an administrators tool and vCAC for as a true private/public cloud management tool for IT service brokers. Hello, truly a great write up, helps understand quite a few items. I do have a few questions and hoping you could address them. In our org, we have implemented vCAC first (without VCD) and did find it user friendly and easy to use but realized it would require a lot of customization and scripting to achieve certain use cases. When discussed with VMware, they suggested, VCD can do certain cases better than vCAC and suggested we should implement VCD along with vCAC to get comprehensive results. From an expert’s point of view, have any one of you seen customers implement just vCAC or just VCD in their org or does it require both to work together to get better results? From what I hear, they are planning to phase out VCD in the future releases and give all control to vCAC, any thoughts on this? Also, I completely agree on the fact that vCAC offers a better end user portal which was lacking in VCD but I have my doubts when it comes to policies and compliance levels. 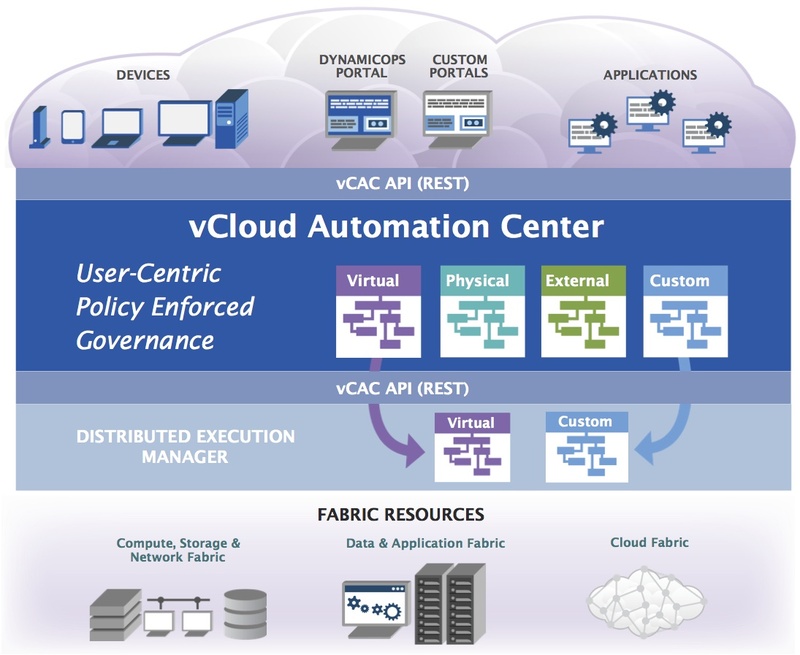 From what I have seen so far, vCAC doesn’t offer any concrete policy structure out of the box and I was told (from VMware services) that VCD provides better policy definition. I find different answers every time I look!! Kindly help me out here. Great questions! I’ll try to address them as clearly as possible; perhaps someone from VMware can jump in as well. 1) I have seen vCAC and vCD as standalone implementations since they were independent products that were actually in competition with one another. 2) As you would expect, vCD has better integration with vSphere and does a better job of vApp resource management. vCAC does a better job of overall governance and applying business rather than IT resource management policies, although as you pointed out, vCAC needs quite a bit of customization. 3) The 2 issues I have with using vCAC and vCD together is that vCD imposes a rigid structure that vCAC has to adhere to so you may lose some flexibility. Also, because the 2 products were designed separately, the integration between them are sometimes weak. Changes sometimes do not propagate properly and there is no dynamic update of changes. If you try to increase the frequency of updates, you start bogging down your network since the vSphere and vCloud APIs can be chatty. 4) You are correct that VMware has made a big bet on vCAC and the integration between the 2 products will hopefully improve in version 5.2. I have no inside information on the future is but eventually, I expect that vCAC, vCD, and vCenter will merge together in some fashion so that there will no longer be a differentiation between provisioning a vCenter vDC and a vCloud vDC. My advice would be to wait until vCAC 5.2 is released and test to make sure it works seamlessly with vCD. Long-term, you will want to implement both if you are committed to the vCloud paradigm. Ken, thanks for the explanation. Appreciate it. Last point you mentioned is quite interesting. Currently vCAC 5.1 does support integration with VCD but with the new release 5.2, it is said it provides seamless integration between the two. In fact, you are not the first to say this as I have been told 5.2 offers 10x times stronger integration between vCAC and VCD. Could you brief about what was capable with 5.1 integration and what new can be done with 5.2? I don’t have details on 5.2 although many of the changes will be in the API integration layer. A VMware guy could probably tell you more. Frankly, the integration between vCAC and vCD with v5.1 is not very good. The communication is chatty and updates sometimes fail; basically the integration is broken. As I mentioned, if you haven’t deployed vCD yet and intend to, wait until vCAC 5.2.